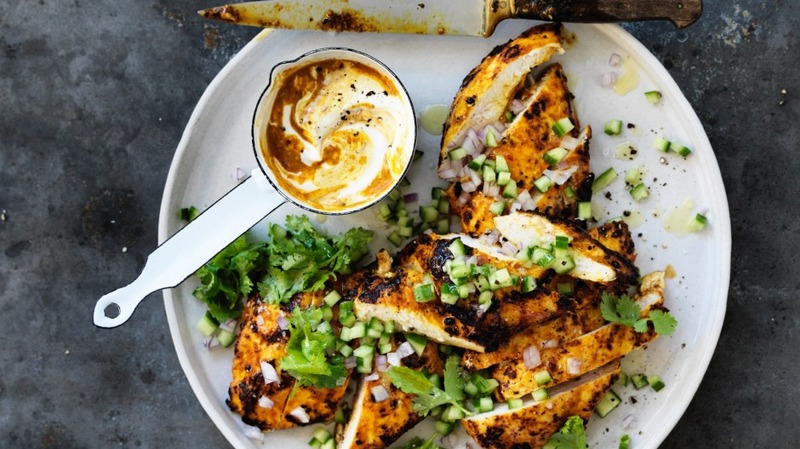 Peri-peri chicken gets a makeover with heady Indian spices and a dollop of tangy yoghurt. 2. Take two tablespoons of the sauce and combine with the yoghurt. Season to taste with salt and refrigerate until needed. 3. Carefully cut each chicken breast in half horizontally to create two thin minute steaks. Working one at a time, place a steak in between two pieces of baking paper and bash with a meat mallet or rolling pin until 1cm thick. Add the chicken to a large bowl with one cup of the sauce and rub until well coated. Refrigerate for at least 15 minutes to marinate. 4. Heat your oven to 100C. Place a large frying pan over medium-high heat and add a little olive oil. Cook the chicken in batches for about 1 minute each side or until just barely cooked through. Transfer to an oven tray and keep warm in the oven until ready to serve. Slice and serve the chicken with the spiced yoghurt and scattered with the cucumber, onion and coriander leaves.